We know that you are concerned about the expense of retaining a lawyer. One of the most common questions we are asked is “how much will this cost me?”. Unfortunately, that is a question we are unable to answer as so many factors go into determining the overall cost. However, we will ensure that you are aware of any cost-saving options available to you throughout the process. We will also provide advice to you from a cost/benefit perspective so that you can make the most informed choice for yourself possible. By far, litigation is the most expensive aspect of family law. It is impossible to predict how many court appearances will be required and how long each appearance will last. It is not unusual to spend a full day at court waiting for your matter to be heard by the judge and allowing time for hallway negotiations to take place. We offer something referred to as “Limited Scope Retainers” to help reduce these costs to you. Under a Limited Scope Retainer (LSR), you choose what services you want to retain us for on your file (i.e. we prepare your court documents for you and provide advice) and what services you will be handling yourself (i.e. you arrange for service and filing of your documents and attend court on your own). At any point, you are welcome to switch between a Full or a Limited Scope Retainer. We have all seen TV court dramas where the lawyers are hellbent on winning their case at all costs. What is almost never shown is the client opening their lawyer’s bills along the way. There is a reason for this: litigating principles is extremely expensive. 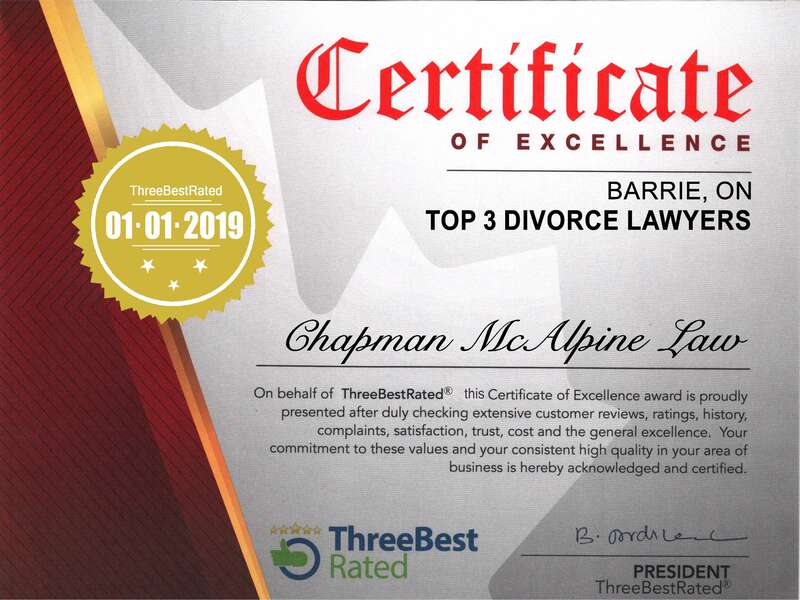 At Chapman McAlpine Law we strive to provide you with sound advice aimed at helping you resolve the issues arising from your separation. When it comes to families, particularly with respect to parenting, there is no single right answer. Therefore, we will provide you with a range of options and explain to you what a court might do given your particular set of circumstances so that you can make the best choice possible for your family. We do not believe there is value to our clients in being difficult for the sake of being difficult. Doing so tends to prolong matters and further polarize parties; neither is it helpful to you or your children. We do not view family law matters as simply cases to be won; our clients are people and the issues they face are as personal as they can get. There is no trophy to be handed out at the conclusion of the matter; there is a family that has taken on a new structure. To us, “winning” is helping our clients navigate from the uncertainty that comes from a fresh separation to an agreement or order that resolves those fears and allows our clients and their children to move forward in as positive a manner as possible. When you retain us, we know that you are putting an extraordinary amount of faith in us and we do not take that responsibility lightly. The vast majority of people who come to us have never gone through a separation before and have very little idea what their rights and obligations are. The internet is full of information but do you really want to entrust your family, your property, and your money to the internet? At Chapman McAlpine Law we will provide you with the answers, information, and advice you need to resolve your matter. You may not always like the advice we provide you, but that will not stop us from providing you with honest information based on your situation. To us, it would be a disservice to you to only tell you what you want to hear instead of telling you what you need to hear.